Learn the 30 Tips that will help you prevent it from happening and what to do if you catch them. 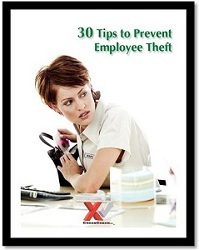 Statistics show that employee theft is a bigger problem for retailers than shoplifting. In fact, about $600 billion is lost annually due to this epidemic. Both problems lead to rising prices and headaches for retail managers. Making periodic and random visits to your store can reduce "skimming"
*BONUS: 5 Things you should do if you suspect employee theft has occurred.